These are "opened box" units that may or may not be lightly used. Either way, we have checked all the parts and replaced any non-functional parts so the MotoTote is fully functional and complete with all hardware. Inspected & re-boxed. Some parts may have scratches, minor dents, cosmetic damage but no damage that would affect proper function and use of the product. This product is fully covered under our new product warranty excluding cosmetic damage. For sport bikes of up to 600 lbs. with rear tire widths of up to 8.50 inches.The MTX Sport is the latest generation of the MotoTote Sport carrier for sport bikes. This MTX version of the Sport is the result of years of customer feedback. We talk to hundreds of customers to find out what riders want. Nobody comes close to MotoTote on design and advanced manufacturing. Our customers praise us for product quality and sophistication. You'll be glad you chose MotoTote. Clearance for fairings - Designed to pamper low-slung bikes with fairings. There are no sharp edges to scratch or gouge fairings. The tail end of the tire track is rounded and tapered so that fairings are not damaged if high-centering occurs during loading. Tire track - Advanced formed tube and wire construction provides good traction for loading and tire stick to keep the bike in place during transport. Modular design and assembly - Assemble according to your needs: Left or right loading, wheel base, etc. Premium grade hardware - Bolts are grade 8 capscrews with nyloc nuts. 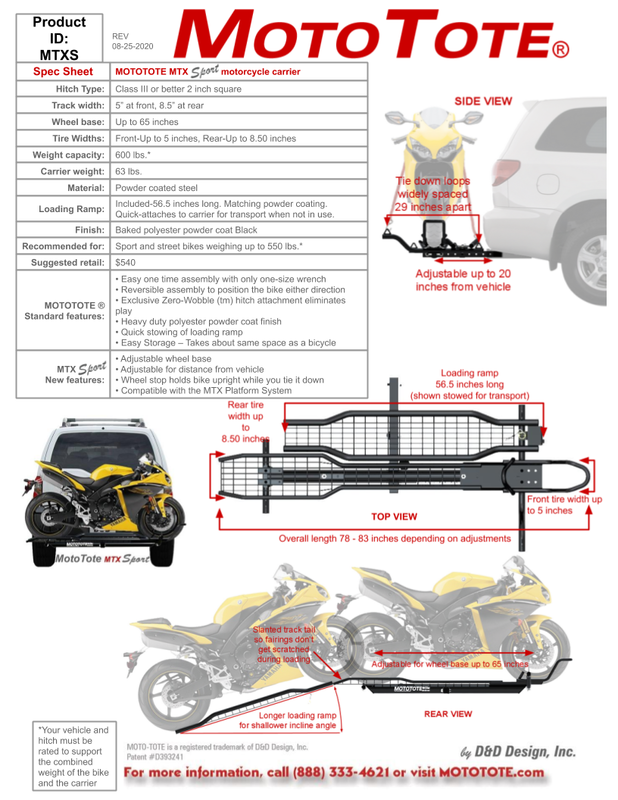 Aviation inspired beam structure - The Moto-Tote MTX carriers are built on the MTX Platform which is a large diameter tube beam that provides structural support for all critical components of the motorcycle carrier. Everything is bolted to this platform: Tie-down arms, tire track, wheel chock assembly, etc. This construction provides superior strength and structural integrity. Adjustable for wheelbases of up to 65 inches (most sport bikes are around 57 inches). Easy loading - Your bike stays upright during loading until tie-downs can be attached. This saves you from trying to hold the bike up while fumbling with tie-downs. Powder-coated - Premium grade black polyester finish. For weather resistance, polyester is superior to epoxy (ask your powder coater). Stronger but lighter - Thanks to superior design for structural efficiency. And last but not leasts - It looks AWESOME! They are warrantied against everything but cosmetic damage that does not affect function, however I can tell you the cosmetic damage is minor. I have used the Mototote MTX Sport Carrier to travel with my S1000R attached to my Jeep Cherokee. I was nervous at first, but after multiple long trips with the carrier, it has worked flawlessly. I even contacted Mototote shortly after receiving my carrier and they were very helpful. I highly recommend this product! What a great deal looked like new to me! Putting this together was easy with directions provided. Looks great and can't wait to try it out! This was the only company to respond to my emails. I mototote was easy to assemble, all parts were present. The performance was just as described. I use this item for a 2015 fe350. Very well built and sturdy. I was able to put on a hook and hang it on the garage wall. Easy to assemble, easy to install, easy to load and unload. That easy.